True Power from the Professionals! The new XGA SERIES Professional Power Amplifiers blows away all the other competition in its class. Each amp comes designed to deliver the maximum wattage and amount of power to any speaker. The XGA Series is sure to blow you and the competition away! 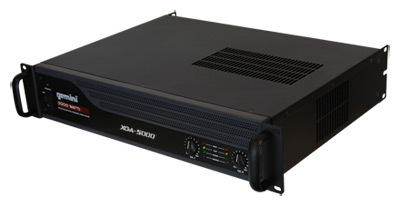 Each XGA amp is durable and lightweight, and offers an unmatched value in their class. With their powerful, reliable performance, the XGA Series amps easily handle any amount of usage and can deliver deep pulsating lows. Whether you’re a DJ performing at an event or a band at a show the XGA amps will deliver the power and quality of sound your need to leave your audience amazed. The XGA Series goes perfect with any Gemini Professional loudspeaker.